Zucchini is my favorite veggie. So I get pretty excited when it is actually in season even though I buy it all year long. My favorite way to eat zucchini is to sauté it until tender. I could eat it with every meal. The awesome thing about this recipe is that I had all of the ingredients on hand. It was dinner time and I was staring in my pantry wondering what I should make. One of our favorite things is this Crispy Parmesan Garlic Chicken. My entire family devours it. We love the crispy flavorful crust on the chicken. So I decided to put the two together and the result was delicious! 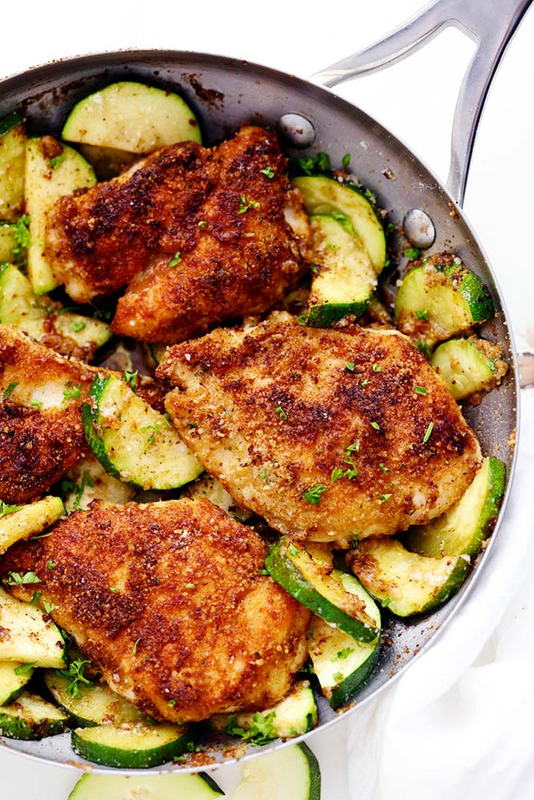 A crispy delicious chicken with tender zucchini that is full of flavor and only require one pan. Lets just take a second to discuss the amazing flavors in this meal. First of all anything with parmesan and garlic is already a winner in my book. But it coats the chicken perfectly and gives it such a crispy texture to the tender and juicy chicken. What I especially love is removing the chicken and sautéing the zucchini in a buttery garlic parmesan sauce. And the crispy sediments of the chicken also are incorporated in the sauce. IT IS AMAZING! This is a simple 30 minute meal that is full of flavor and my favorite vegetable is the star of the dish! You guys are going to love this one. Takes 2 5 min , serves 4.